HOUGHTON — Forget the hot, red blob that so many of us drew under the cone of a volcano in eighth grade science. 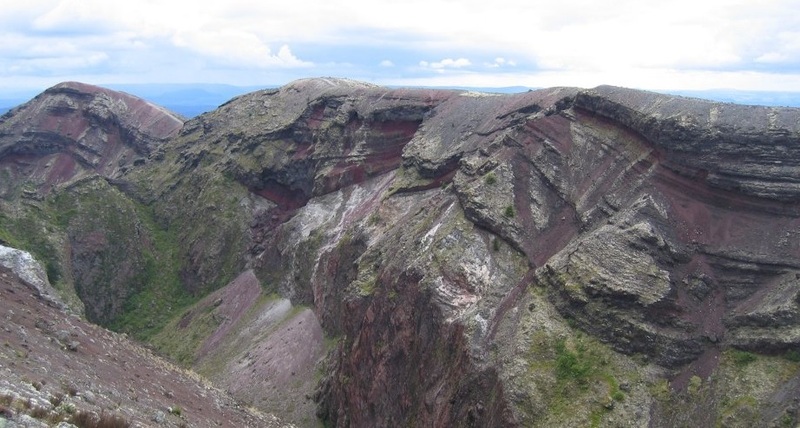 Magma chambers are chemically and physically complex structures that new evidence suggests may be cooler than expected. Volcanologists are gaining a new understanding of what’s going on inside a shallow magma reservoir that lies below an active volcano, and they’re finding a colder, more solid place than previously thought, according to new research published June 16 in the scholarly journal Science (DOI: 10.1126/science.aam8720). It’s a new view of how volcanoes work and could eventually help volcanologists get a better idea of when a volcano poses the most risk. Chad Deering, an assistant professor of geology at Michigan Technological University, is one of the co-authors who helped lead field research on New Zealand’s North Island. The team extracted zircon minerals from volcanic rocks around the slopes of Mt. Tarawera, deposited during the Kaharoa eruption in 1314, which is New Zealand’s largest eruption in the last millennium. He adds that ongoing research shows that a lot of magma — particularly silicic magma that freezes completely into granite or reaches a melt-rich state and explodes in big eruptions — is more like mush than pure liquid. The Kaharoa zircons were in contact with liquid, and their crystals record a history of long spans of cooling with only punctuated periods of heating that leave the magma in an eruptible state. It’s hard to study magma directly. Even at volcanic sites, it lies miles beneath the Earth’s surface, and while geologists have occasionally drilled into magma by accident or design, heat and pressure destroy any instrument you could try to put into it. Instead, Deering along with corresponding author Kari Cooper from the University of California-Davis and their colleagues study the chemical log recorded in the zircon crystals from Mt. Tarawera. The Kaharoa eruption, roughly five times the size of Mt. St Helens in 1980, brought up the zircons, which had been exposed to much of the record of temperature and chemistry changes in the magma reservoir history. Once on the surface, that record of the past was frozen in place. The researchers found that all but one of the seven crystals were at least tens of thousands of years old but had spent only a small percentage (less than about four percent) exposed to molten magma. The picture that emerges, Cooper said, is less a seething mass of mostly liquid molten rock than something like a snow cone: mostly solid and crystalline, with a little liquid seeping through it. Coauthors on the paper are: Allison Rubin at UC Davis; Christy Till and Maitrayee Bose, Arizona State University; Adam Kent, Oregon State University; Fidel Costa, Nanyang Technical University, Singapore; Darren Gravley and Jim Cole, University of Canterbury, Christchurch, New Zealand.